Who is the Red Paper Clip and Why Should He Inspire me on a Sunday? Kyle McDonald is the “red paper clip guy” and he traded a red paper clip (worth basically nothing) for a house (worth quite a lot). The story was pretty big in Canada back in 2006. I found out about it through my PR boss Jonathan Hopkins who shared the story in the office one day. What was once a red paperclip is now a house. Nice work, Kyle MacDonald. What do you mean he traded a Red Paper Clip for a House? Kyle McDonald wants to dream big – he was unemployed but wanted a house to live in. He did own a red paperclip though. He has a brainwave and so he starts a website about trading a red paper clip for something else. He is looking for an upgrade. On the 14th July 2005 he made the first trade of his single red paper clip for a fish shaped pen, in Vancouver. 14 trades later and he had a house. In less than a year. On July 6th 2006, Kyle swapped a movie role for a house in Kipling, Saskatchewan, Canada. Amazing or what? 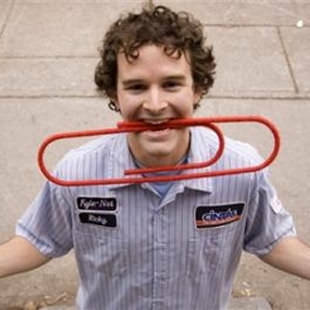 Kyle MacDonald – Red Paperclip Guy. 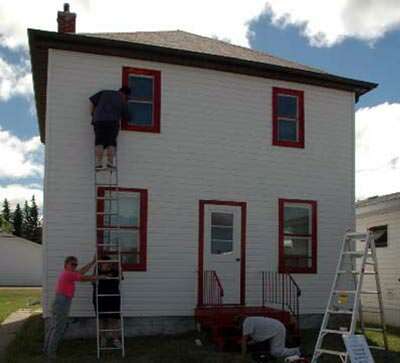 From the BBC Report on Red Paper Clip Guy: “It took Kyle exactly a year of 14 internet trades to move from the red paper clip to a house on Main Street in the tiny town of Kipling in Saskatchewan province – a place he has never been to before. Now the 26-year-old is planning to write a book about the venture which saw him trade up through a novelty doorknob, a camping stove, a snowmobile, a recording contract, and an afternoon with rock star Alice Cooper. Now the question remains – If one red paperclip is worth a house, then how much is a one man free travel blog to more than 80 countries around the globe going to be worth? 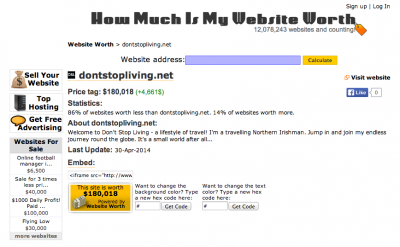 Dont Stop Living is worth $180,000 US apparently. But seriously, how far can you go? What ideas can you come up with? How far can a travel blog go? 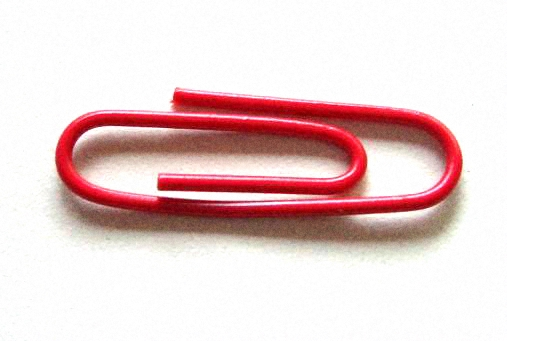 How much money can you make from a red paperclip? How much money can you make from a travel blog? You can have anything if you want it enough, I strongly believe that now. Thanks to Jonathan Hopkins and Kyle MacDonald for the inspiration. Kyle MacDonald’s Blog One Red Paperclip. 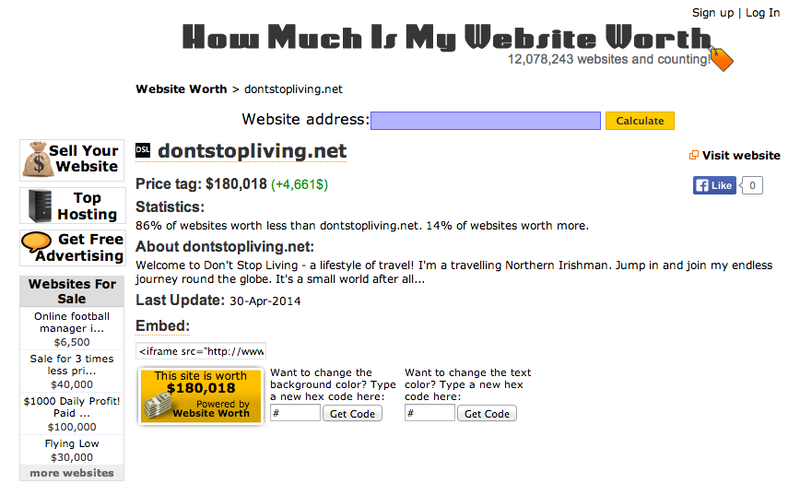 Thats quiet marvelous that your website is worth a 6 figure some johnny. I brought my website via weebly and website worth said it was worth $1k even after only being online for 1 month. But there are people out there who buy and sell domain names. I had not heard of this story. Very inspiring!